Dr. Angela Demeter obtained her Bachelor of Science degree from McMaster University. She completed her Doctor of Dental Surgery degree at the University of Toronto where she was chosen to participate in a dental externship program at the Karolinska Institute in Stockholm, Sweden. 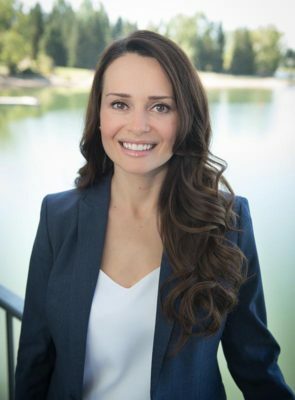 After completion of a General practice hospital residency in New York City, she continued her postgraduate education at the University of British Columbia in the Graduate Periodontics & Implant Surgery program. She received her Specialty degree in Periodontics & Masters in Craniofacial Science in 2010. Angela was recognized at UBC for her outstanding theoretical performance and excellence in implant surgery with the “Nobel Biocare Achievement Prize” and was selected to represent UBC at the Nobel Biocare Global Symposium in NYC. She has provided dental care for First Nation communities in Northern Ontario and the Queen Charlotte Islands. Angela has mentored numerous study clubs and has lectured in continuing education courses for dentists and dental hygienists on periodontal procedures and dental implants. She serves as an Associate Clinical Professor at the University of British Columbia. In her spare time, Angela enjoys spending time with her husband and two young children. Call us at (403) 278-5446 to book your consultation appointment with Dr. Angela Demeter today!